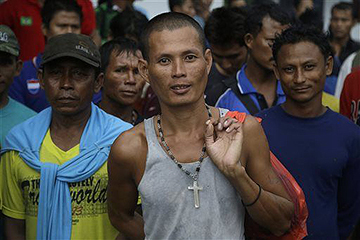 The same trawlers that had enslaved countless migrant fishermen for years carried more than 300 of them to freedom Saturday, following a dramatic rescue from a remote Indonesian island that many men believed would likely be their final resting place. They moved in an orderly, single-file line with colored ribbons tied around their wrists to identify which of the six vessels had brought them. They were tired from the long, cramped journey, but smiled and laughed while talking about the new lives they were about to start. At one point, a group sang and clapped their hands. 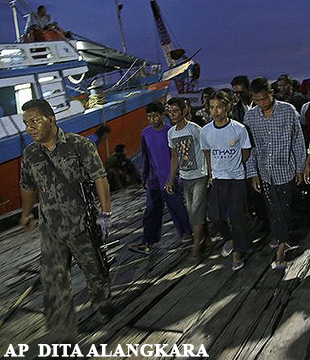 But mostly, the fear of being beaten or killed by their captors had finally lifted.After 17 hours overnight at sea, the men, mostly from Myanmar, took their first steps of freedom. They filed off the boats and walked to the site of their new temporary home where they were finally safe. "I'm so happy, I wanted to go home for so long," said Aung Aung, 26, who lifted his hair on the left side of his head to show a fat, jagged scar stretching from his lip to the back of his neck — the result of a machete attack by his captain's son. "I missed home and especially after I was cut ... I was afraid I would die there." 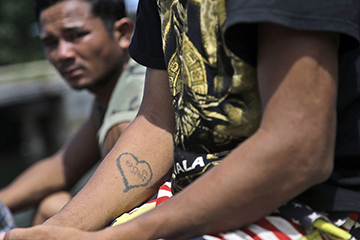 The Burmese men were among hundreds of migrant workers revealed in an Associated Press investigation to have been lured or tricked into leaving their countries to go to Thailand, where they were put on boats and brought to Indonesia. From there, they were forced to catch seafood that was shipped back to Thailand and exported to consumers around the world, including the United States. In response to the AP's findings, an Indonesian delegation visited the island village of Benjina on Friday and offered immediate evacuation after finding brutal conditions, down to an "enforcer" paid to beat men up. The officials from the Fisheries Ministry offered the men a chance to leave, fearing they would not be safe if they stayed on the island after speaking out about the horrendous labor abuses they endured. 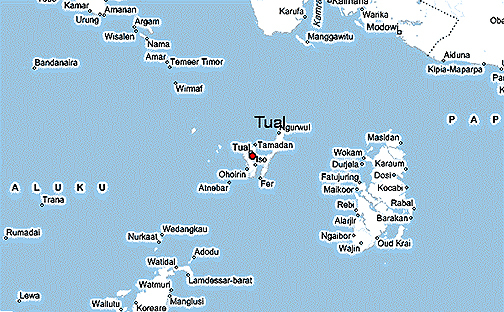 After arriving on the island of Tual on Saturday afternoon, the men were given traditional packets of Indonesian rice wrapped in paper. Those who were sick or injured were offered medical care by paramedics inside ambulances. The ministry has expressed some concern over how to feed so many people for an extended period of time, but a large open-air pavilion is being provided for the men to sleep under. The accommodation is crude with a concrete floor, but it has a roof to keep them dry and, most importantly, they are safe. Officials from Myanmar are set to visit the islands next week and will assist with bringing the men home and locating others who are still trapped. 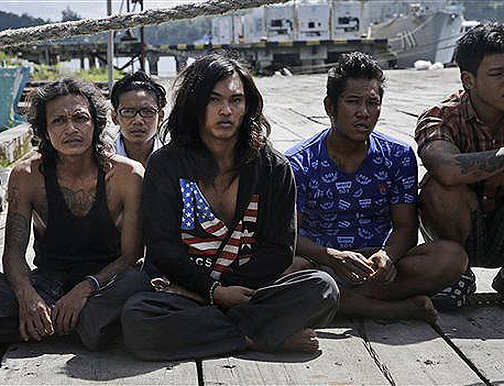 Friday's unexpected rescue came after a round of interviews Indonesian officials held with the fishermen, where they confirmed the abuse reported in the AP story, which included video of eight migrants locked in a cage and a slave graveyard. The men talked of how they were beaten and shocked with Taser-like devices at sea, forced to work almost nonstop without clean water or proper food, paid little or nothing and prevented from going home. There was essentially no way out. Benjina is in the far reaches of Indonesia and so remote, there was no phone service until a cell tower was installed last month, and it is a difficult place to reach in the best of circumstances. Some of the men said the abuse went even further at the hands of an Indonesian man known as "the enforcer." He was deeply feared and hated by the workers, who said he was hired by their boat captains to punish them for misbehaviour. Thailand, the world's third-largest seafood exporter, has been under further pressure to clean up its industry since the AP tracked a boat of slave-caught seafood by satellite from Benjina to a port outside of Bangkok. Records then linked it to the supply chains of some of America's largest supermarkets and retailers and among the most popular brands of pet foods. The U.S. State Department said Friday that it is pressing Myanmar to quickly repatriate the men. U.S. companies also called for action and commended Indonesian officials. "We don't condone human trafficking in the supply chain, and we applaud the government's work to end this abuse. Our hearts go out to these men, and we wish them well on their journeys home," said Marilee McInnis, spokeswoman for Wal-Mart, the largest retailer in the U.S., which was among those the AP found with supply chains linked to tainted seafood. 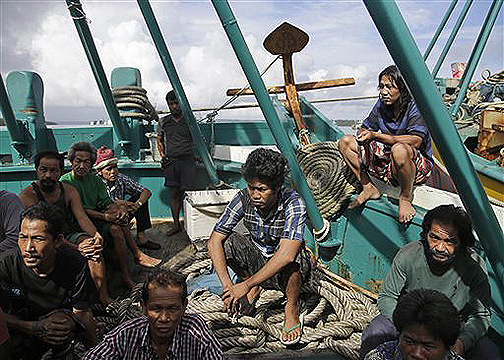 The International Organization for Migration has said there could be as many as 4,000 foreign men, many trafficked or enslaved, who are stranded on islands surrounding Benjina following a fishing moratorium called by the Indonesian Fisheries Ministry to crack down on poaching. The country has some of the world's richest fishing grounds, and the government estimates billions of dollars in seafood are stolen from its waters by foreign crews every year. 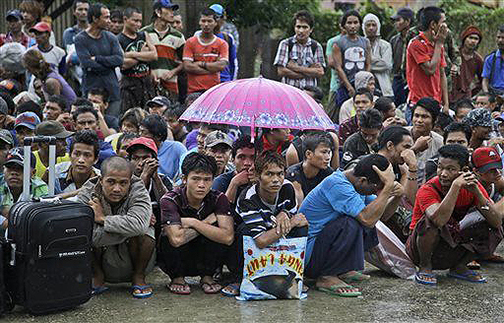 Three-quarters of the more than 320 migrant workers who left the island on Friday were Burmese. Others were also from Cambodia and Laos, and a few Thais were allowed to board the boats. However, the Indonesians said most Thai nationals could stay on Benjina more safely, since Thai captains were less likely to abuse them. Many of the men hugged and jumped in the air when they learned they were finally leaving the island, but others worry it will be difficult to readjust to the countries they left behind. Phong Myant Aung, 37, worked on trawler for six years and said he was constantly physically and verbally abused and not given medicine when he got sick. Mason reported from Jakarta, Indonesia. Associated Press writers Bradley Klapper in Washington and Martha Mendoza in San Jose, California, contributed to this report.